In case of cancellation or now show 50% of the total fee will be charged. To respect the rules of the property. 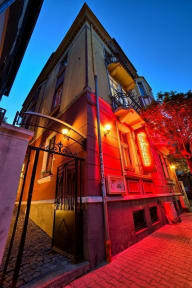 Guest House 32 is situated in the heart of Sofia main shopping, business and historical attractions. Guesthouse32 combines the unique sense to be in the middle of the party, but to enjoy your privacy in the quite and safe atmosphere of the small back-street. A step away from the pedestrian Vitosha blvd, with its cafes, bars, restaurants and live performances, Guesthouse32 combines the unique sense to be in the middle of the party, but to enjoy your privacy in the quite and safe atmosphere of the small back-street. All main places of interest in Sofia are at walking distance: Vitosha Boulevard (50m), National Palace of Culture (200m), National Theater (300 m), Archaeological Museum (400 m), Ancient Serdika Complex and Fortress (400 m), The Presidency (400 m), The Russian Church (0,5 km), The Roman Basilica St Sofia (800 m), St Alexander Nevsky Cathedral (800 m), Opera House (1 km). Sofia Airport is 7 km away. Each of our 6 rooms has its own decoration and style. All rooms share a two modern baths and two toilets. Free wi-fi is available everywhere. Free city tour and free city map on check in. 24/7 free coffee and tea while relaxing in our terrace/winter garden. Transfers, excursions, rent a bike/car can be booked on site. A cosy Italian restaurant downstairs. Breakfast, laundry & drying services for a small extra cost. The guest’s safety is guaranteed by the safe area, our security system and a night porter. 10 % off in our restaurant and 15% in The Green Bar at Vitosha blvd. Full buffet breakfast is served for 5.00 euro p.p. Check in time from 14 to 21 PM. Payment types: cash, credit cards, debit cards, 5% charge when paying by credit card. This property may pre-authorise your card before arrival. When you book a non refundable rate, the property will contact the guest for a cvv code and if the guest won't provide the cvv code within 24 hours the booking will be cancelled. A buffet style breakfast could be ordered on place at cost of 4.00 euro. All the guests have to inform us about the expected time of their arrival when make the booking. The reception is open from 01:00 PM to 09:00 PM. However earlier or later Check could be possible, but must be agreed and confirmed by the hostel at least 1 day in advance. A late check in fee may apply in this case. If the Customer remains in the room longer than the times stipulated above, the Hostel can charge an extra 50% of the room price. If the Customer remains longer than 6 PM, the Hostel can charge an extra 100% of the room price. All the rooms have personal key. The Hostel is not responsible for any personal belongings or missing items. Het hostel is aan iedereen aan te raden! Men is er super vriendelijk en geeft je alle info die je nodig hebt. Als er een probleem is, staan ze onmiddellijk paraat. Voor deze service keer ik graag terug!! De beste hostel die ik (en mijn vrienden) al heb bezocht. De foto's op de site tonen een minder goed beeld dan in werkelijkheid. Een dikke duim voor deze hostel waar hygiëne en verantwoordelijkheid van de bezoeker centraal staan. Nice guesthouse near to the mainstreet. Big and clean rooms.